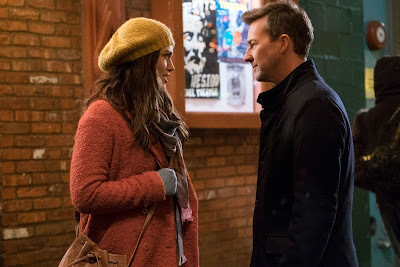 Despite being a story around Will Smith's character, Edward Norton steals "Collateral Beauty" with a charismatic and honest performance. Howard, played by Smith, is mourning the loss of his daughter by writing letters to three abstractions, time, love and death. Smith is a fantastic actor who portrays an emotional character with so much grief. He is dramatic and can pull the emotions out of anyone who has dealt with loss. When his three business associates – Whit, played by Norton, Claire, played by Kate Winslet, and Simon, played by Michael Peña – decide to hire to actors – Brigitte, played by Helen Mirren, Amy, Played by Keira Knightley, and Raffi, played by Jacob Latimore – to play Death, Love and Time and to go to Howard and answer his letters. Norton is just fantastic playing a humorous, yet emotional business man dealing with life after divorce and having a daughter that dislikes him because of it. He grabs hold of the audience's attention and steals the spotlight from Smith. Knightley is brilliant in her role and matches with Norton having several scenes throughout the movie which stand out. Her emotion feels true and can lead the audience to sympathize with her. Winslet is great, for what is seen of her story. There's not much the audience can grab on to about her character and leaves the story of her character lacking. Peña is convincing as his character, but much like Winslet is not really seen as much and does not give enough of his back story to let audiences connect with his character. Mirren is fantastic as an actress and as Death. She is one of the positive parts of the movie which audiences will enjoy. Latimore embodies the youthfulness of his character well and gives some aggressiveness to his portrayal of time. He delivers his lines with such ease that audiences can lose themselves into his story and have it flow out like natural speech. The entire story is difficult to sum up, but its a great story for the holiday season. I give this drama a 3 out of 5 Popcorns. Although it has great parts to the story and the complexity is refreshing, it targets an audience which has dealt with major loss. The movie fells much like a stage production and yet much of the actual story feels left out. The overall story of Howard can get drowned out by the amazing acting from the supporting cast. The resolution seems to come out so quickly and runs long to where more is explained than what feels needed. "Collateral Beauty" is now in theaters.